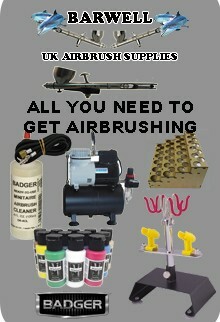 Technical support and a repair service is available for all of the Badger airbrushes we stock and sell. See charges below for our services. Please contact us via e mail or telephone 01455 842648, so we can estimate the turn around time for your repair / service. When sending an airbrush through the post make sure it is in a good strong box, and as plenty of padding, the address is clear and can be seen easily, we advise you to send it next day post as this provides adequate insurance cover just in case it gets lost. With the airbrush make sure you provide , Your Name, the Return Address, Pay Pal email address for payment, email and or phone number so we can contact you quickly should we need to, and a description of the problem. Once we receive your airbrush we will examine it, if any new parts are required a cost will be worked out for the parts, service, and return postage, at that time we will contact you to advise of this cost, and authorisation to continue with the work required. We will contact you on completion of the service and any parts required to your airbrush, at which time we will require full payment, once we receive the payment we will post your airbrush to the address you provide.